It's VERY important to pay close attention to the airplane weight and balance. Why? Well, because if your radio controlled pride and joy is not balanced properly she's likely to crash on her maiden flight! I once made some repairs to my plane after a nasty landing. The extra weight from reinforcing the rear of the airplane made her a bit tail heavy. Lesson learned! A tail heavy airplane is destined to crash! 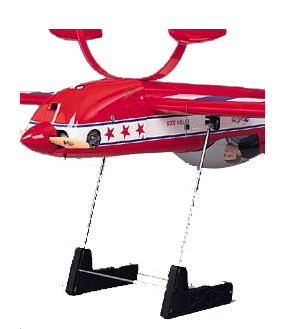 A slightly tail heavy RC airplane will be very unstable and extremely sensitive to the slightest elevator input. But anything more than slightly tail heavy is completely unflyable! An airplane is more stable when it is slightly nose heavy. An excessively nose heavy airplane will be very sluggish to elevator commands and will land very fast! While it's not good to be nose heavy, it's much better to be slightly nose heavy rather the tail heavy. If there is any doubt always err in the direction of a slightly nose heavy airplane. The manual for every radio controlled airplane (whether it be in the form of a kit, RTF, or ARF) will tell you exactly where the center of gravity (CG) for the airplane should be. It is generally pretty close to the main wing spar. If you're airplane is powered by an engine, always make sure the fuel tank is empty when balancing the airplane. Mark the wing at the location indicated in the manual. With the airplane facing towards you, place an index finger on each wing exactly where you made the marks. Gently raise the airplane. When your RC airplane is perfectly balanced it will sit level on your fingertips with the nose just slightly downward. If your airplane is tail heavy the nose will rise. If the airplane is nose heavy the nose will fall. You naturally want to minimize the addition of weight when balancing your RC airplane. Many times airplanes can be balanced without adding any weight by moving the battery pack. If your RC airplane is nose heavy, see if you have room to move the battery pack towards the rear of the airplane. For tail heavy airplanes move the battery pack forward. This is a trial and error procedure that requires you to remove and replace the wing each time you check the balance. When your RC airplane is finally balanced with nose slightly down, be sure that you secure the battery pack as well as the receiver so that nothing moves during flight. This can be done by stuffing foam around the components. In addition to using foam packing, it may be necessary to glue a couple pieces of scrap balsa wood on either side of the battery. Depending on the weight of the engine/motor, it may be necessary to add weight to the airplane to balance it properly. Any weight added needs to be as far away from the center of gravity as possible to minimize the amount of weight needed. If your RC airplane is tail heavy, it is best to glue some weight on the firewall. If your RC airplane is nose heavy, add the weight as close to the end of the fuselage as possible. Great Planes makes a superb RC airplane balancing machine that takes all the work out of balancing your RC airplane. This is one tool that every RC pilot should have, and most do! Instead of picking the airplane up with your index fingers after each adjustment, you simply sit the plane on the tool. Sit the weight on top of the plane where you plan to glue it. Add or subtract weight until the airplane is balanced with nose slightly down. After you determine how much weight is needed, glue it down securely. If you don't have a balancing tool, don't worry! You can still balance your airplane. It will just be a bit more tedious. Add weight to either the rear or front depending on where it's needed. Use just enough glue to hold the weight from moving, then check the balance by lifting the plane with your fingertips. Repeat the process until the airplane is balanced. Then glue the weights securely to the airplane. What to Use for Weight? Any thing can be used for a weight. You can use nuts, bolts, fishing weights, or anything that can be fastened securely to the airplane. You can also buy weights designed specifically for balancing RC airplanes. When adding weight to the rear I like to tear a hole in the covering and glue the weight to the inside of the airplane so it can't be seen. But there are stick-on weights that can be placed to the outside of your RC airplane. You always want to fly your airplane the first time with the CG in the location dictated by the instruction manual. Once you are comfortable flying your airplane you can move the CG back slightly to make the airplane more aerobatic. If you decide to move CG back it is very important that you do it in very small increments of 1/8" at the most! It is worth noting that balancing RC airplanes with low wings requires that the airplane be upside down. You can see this in the above picture of Great Plane's CG machine. This makes the process more accurate as low wing airplanes are most stable when upside down. Balancing RC Airplanes from wing tip to wing tip is not nearly as important and balancing them from nose to tail. How the airplane performs in some aerobatic maneuvers can be affected by the "side to side" balance. For this reason, it is always a good idea to check the "side to side" balance on your RC airplane. This is quite easy to do. Simply put the airplane's spinner on the work bench and hold the airplane up by the tail. Balance the tail on the back of your hand and observe which the airplane wants to roll. Do this several times. If it is out of balance it will roll to the same side each time. It will be obvious if you need to add weight. I personally have never had an airplane where weight was required to balance it side to side, but it's always good to check! If you do need to add weight you want to add it as close to the wing tip as possible to minimize the weight. You could add weight to the outside of the wing but it would look much better if you tore a small hole in the covering and glued the weight where it won't be seen. If you're new to flying RC airplanes you will find the links below very helpful. If you have any questions and can't find your answer on the below pages, by all means ask your RC questions here!